As was rumored last week, Activision will publish a NASCAR-licensed game and racing-focused studio Eutechnyx will be building it, according to an official site launched today with a countdown clock that hits zero in five days. EA Sports had published NASCAR games from 1996 to 2009, ending with NASCAR Kart Racing on the Wii, the most recent dedicated NASCAR title on any console. Gran Turismo 5, due Nov. 2 on the PS3, does feature NASCAR licensing and vehicles. 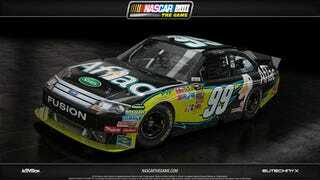 The NASCAR deal Activision the first major sports league or series it has had in recent memory. It's most noteworthy sports titles have come with Tony Hawk (skateboarding), Cabela (hunting) and Rapala (fishing) as licensors. Activision made a licensed paintball game in 2008 that was poorly received. Its only current licensed team sports game is Little League World Series Baseball. Update: ESPN's Jon Robinson has much more on this game through an in-depth interview with Eutechnyx's Ed Martin, the studio's executive vice president for North America. Second update: This story was edited at 5:53 p.m. to reflect that Eutechnyx is the licensee; Activision is just the publisher.